A NOAA team recently collected 14 metric tons of fishing gear, plastic, and other debris from the shoreline and waters around Midway Atoll. The collected debris consisted largely of derelict fishing gear and plastic. A team of divers and oceanographers from the Coral Reef Ecosystem Division of NOAA's Pacific Islands Fisheries Science Center recently removed 14 metric tons of debris from the near-shore environment around Midway Atoll. The tiny island, located 3,218 km from the Hawaiian mainland, played a pivotal role as a U.S. Navy base during World War II, and is now part of the Papahānaumokuākea Marine National Monument. The collected debris—equal in weight to an 18-wheeler—consisted largely of derelict fishing gear and all sorts of plastic. The largest single piece of debris removed by the team was a seven-meter-long vessel swept away during the March 2011 Tōhoku earthquake and tsunami in Japan. "Marine debris, particularly discarded and lost fishing gear, is a substantial source of coral damage in the Northwestern Hawaiian Islands," says team member Matthew Parry, a NOAA fisheries biologist. "The gear can lodge on the corals and smother or break them. Removing large amounts of debris in and around the coral reefs near Midway Atoll will help prevent future injuries to sensitive coral habitats." Parry also points out that scientists are striving to learn more about the broad and long-range impacts of debris on the marine environment. "Marine debris affects the ocean at all levels—from planktons, which can ingest microplastics and may carry them up the food chain to protected species, to larger-scale issues like the degradation of coastal habitats. 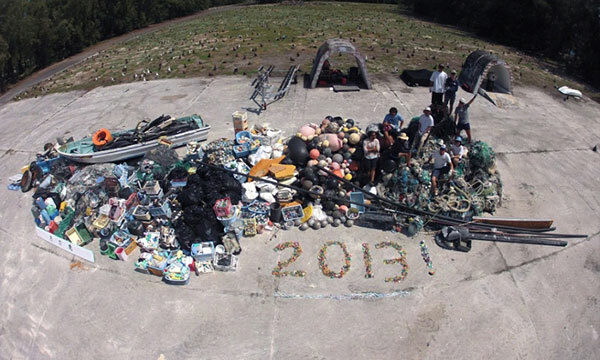 It's important for us to keep pressing the issue of marine debris." When the research ship M/V Casitas ran aground on the remote coral reefs of Pearl and Hermes Atoll in 2005, NOAA's Damage Assessment, Remediation, and Restoration Program (DARRP) and other trustees conducted a Natural Resource Damage Assessment (NRDA) to determine the extent of the injured resources. The NRDA process resulted in a $3.8 million legal settlement that provided funds for the trustees to remove massive amounts of marine debris from the Northwestern Hawaiian Islands over several summers, starting in 2011.